Just like the mouth is full of bacteria and needs constant and regular hygiene to prevent gingivitis, so do the eyelids need constant and regular hygiene to help prevent, as part of a healthy lifestyle, the risk of blepharitis and dry eye. It is recommended that BlephEx® be repeated every 4 to 6 months. With regular treatments, as part of a healthy lifestyle, patients may be able to reduce their risk of recurrent symptoms of with dry eye and MGD. The Specialist will put in numbing drops which make the cleaning procedure more comfortable. In fact, most patients report a tickling sensation, but no pain. Is BlephEx® covered by medical insurance? No, BlephEx® is a cleaning procedure for dry eye that is not covered by insurance. You can use cash, check, credit, or even an FSA or Health Savings plan to pay for the procedure. Can I perform BlephEx® at home? 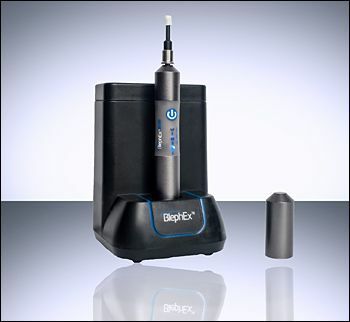 No, due to the close proximity of the eye, BlephEx® is only to be performed by a professional eye care specialist or trained staff, in an office or hospital setting. I wear contact lenses. Should I have a BlephEx® procedure on my eyelids? Yes! Contact lens wearers are 10 times more likely to develop an early biofilm and will get inflammatory damage to their tear glands much earlier in life. Having regular BlephEx® cleaning procedures performed every 6 months will keep your eyelids healthy.